PocketHealth is a patient app developed by Cognovant as a mobile Personal Health Record (mPHR) available for the iPhone, iPad and Android platforms. 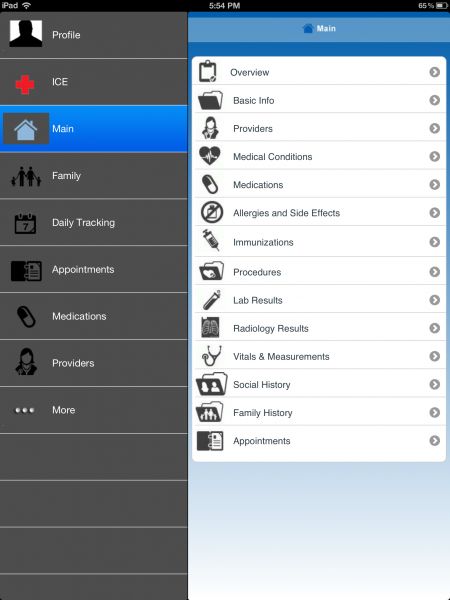 This is an ambitious and comprehensive app based on Electronic Health Record features for individual use. It’s stated purpose by the developer is to allow consumers to take control of their health data. It is encrypted and stored solely on the device. There are future disease specific modules in development. Also planned is the ability to sync the app across devices. Cognovant includes a lengthy disclaimer that explains how they collect information specific to the app’s usage but no confidential information that is entered into the app. The analysis of this app revealed how critical it is for app developers targeting patients to use medical terminology patients can understand. 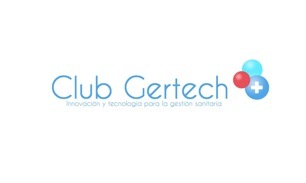 We will explain further in this review. Some information can be entered both by tapping on the left side of the screen or one can tap on Main which will allow the user to add more specific facts, such as Medical conditions, allergies, immunizations, etc. Appointments include a map link and a nice feature option of adding the appointment to the native calendar app on your device. There is a customizable area on for putting notes that could be used for asking questions of one’s physician. The medication list is not customizable but very extensive, perhaps too extensive for the average home user. For example “fish oil” is not in the list but “Omega-3 Acid Ethyl Esters” is. However, the fish oil bottle may mention eicosapentaenoic acid or EPA and docosahexaenoic acid or DHA. It will probably mention Omega-3 acids but how will a patient know which one to pick? There are similar issues in the medical condition screen where all cancer choices were very specific (adenocarcinoma of the prostrate) but there were no breast cancer choices at all, even specific ones such as ductal cancer. If “cancer” was typed in a similar issue occurred. A physician would have trouble with this list, much less the ordinary user. If “Other” is chosen, the next screen will allow the user to write breast cancer in the notes. 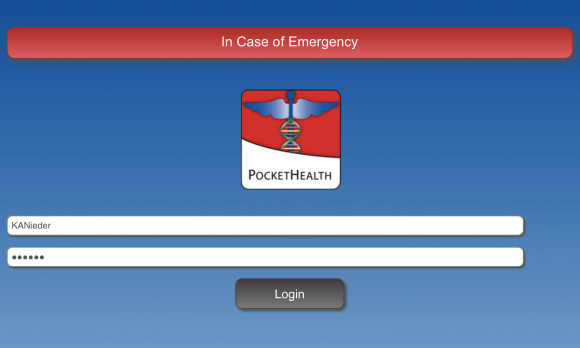 The app is password protected but there is an emergency button available that can be pressed for basic healthcare facts without accessing the rest of the recorded information. 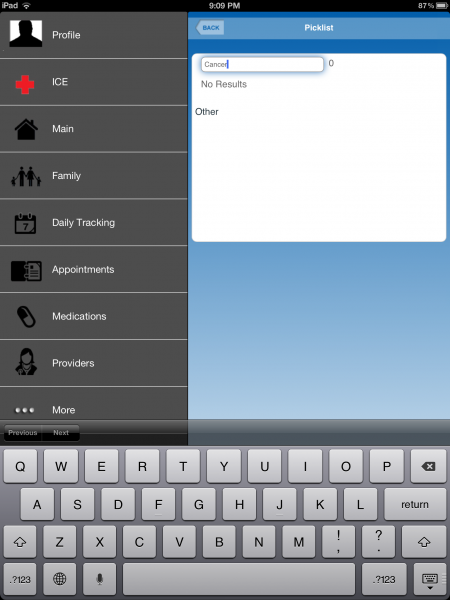 Is there Medical Literature to Support Personal Health Record app use? While there is evidence that Electronic Medical Records (EMR) improve healthcare quality and efficiency, PHRs have not been specifically studied sufficiently to offer conclusive data. Multiple entities, such as the Mayo Clinic, Veteran’s Administration and HIMMS are supporting efforts to encourage patient use of these records. Medications and Immunizations are not customizable, forcing patients to use pick lists that are too technical. There appear to be common medical conditions lacking from the pick lists. All immunizations are in “medical-ese”. Patients may not understand the difference between a Td, Tdap, or tetanus toxoid. Ambitious app that allows patients to securely record and track all aspects of one’s personal health record including, but not limited to, immunizations, medications, diagnoses, allergies, side effects, family and social history, heath insurance, providers and appointments with the potential to share information via XML with providers. With the upgraded version the entire family’s information can be kept in one place and upgraded as time goes by. As a clinician it is obvious the interface was built from an electronic medical record platform and very easy to use but unless the end-user has some background in medicine the more specific components of the app may be difficult to understand. 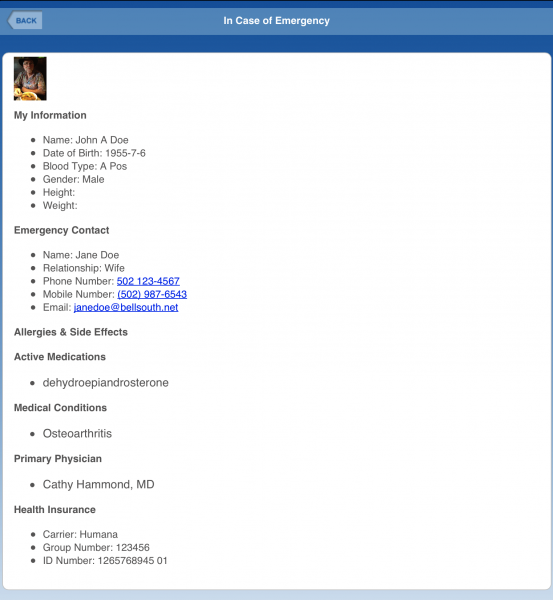 It utilizes medical language in those sections where patients must choose medications, immunizations and medical conditions from drop-down lists (detailed in the above screen shots). 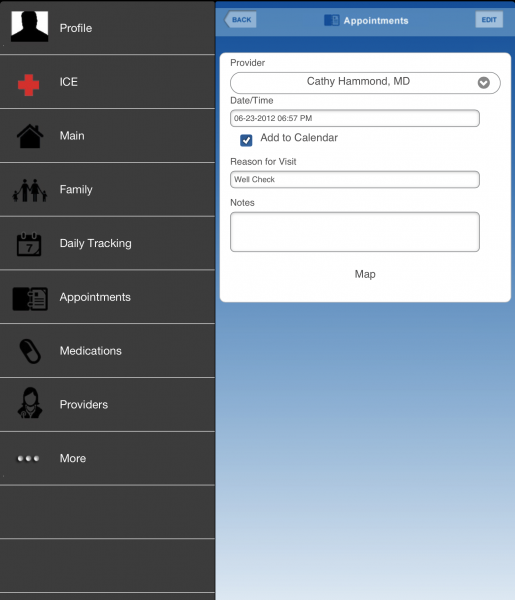 This app would be difficult to use by the ordinary consumer with no medical background. The choices in the medical condition, medication and immunization sections need to be simplified for all but the most sophisticated of patients. Hopefully future versions will be less technical in these essential areas because this app has potential. Kathy Nieder is a Family Medicine doctor in Louisville, KY. She has utilized mobile health technologies beginning with the earliest versions of Epocrates for the Palm Pilot to today’s robust mobile apps for both patient and physician. She believes the use of mobile technology and social media can greatly enhance patient engagement in medical care and improve outcomes. When not practicing medicine traditionally or socially, Kathy enjoys improving her French and Spanish speaking skills and spending time with her two dynamic adult daughters and long-suffering (28 years) husband.